Color(s): mahogany or rich chestnut red Coat: A silky and feathered coat, this breed has a medium length coat. Distinct feature: Very lively, energetic, and impulsive. The Irish Setter loves to run. This breed should always be kept on a lead when outdoors as they have the tendency to run off and can be difficult to catch. Requires firm and consistent training. 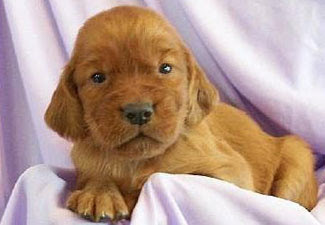 Temperament: The Irish Setter is affectionate, loving, and sensitive, this breed is not recommended for the average home. Being very active, they can become somewhat destructive if left alone for long periods. This breed requires entertainment if they are to be well mannered and respectful. Activity: The Irish Setter requires regular exercise. Three walks per day are recommended as this dog has the tendency to become restless. This breed is not for apartment life and does best with a medium to large sized yard, or great for the country environment.